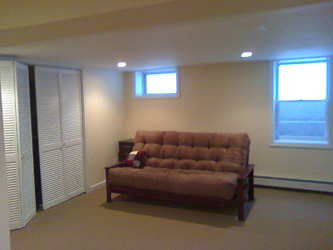 In 2009 I converted the unfinished basement of this Waltham, Massachusetts cape, effectively doubling the living area of the home and making the upstairs more livable as well. Pictured here is the the new office area, created by removing the entire right rear hall wall that bordered the former 2nd bedroom. The master bedroom was made larger by incorporating a section of the hall, which unnecessarily ran the entire distance of the house. Shown on the right in the new office area is a knee wall for the stairway to the basement. 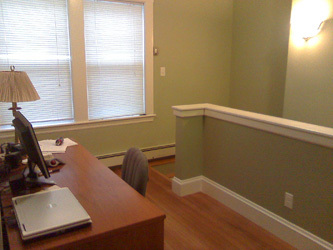 The desk sits at the back of the generous closet that was added to the master bedroom. 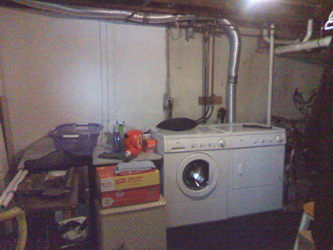 The laundry area in the basement was not addressed in this renovation, and is isolated from the newly renovated basement living area by partitions. I included this photo to show the general condition of the basement before the renovation. The walls and basement floor in this house are poured concrete. The height from the basement’s concrete floor to the first floor joists is 7′-1″, so we were just able to meet the 7′ basement ceiling height as dictated by the building code. Angling the joist headers above the bottom of the stairs allowed us to comply with the minimum 6’8″ head room above stairs. 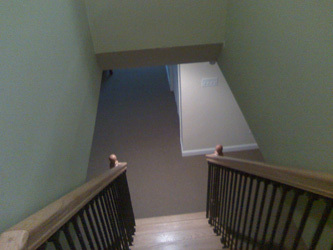 Placement of the stairs was also affected by the corner of the laundry / furnace room seen in this photo at the bottom of the stairs. A view of the newly finished basement. To the right of the stairs and the exercise equipment you can see one of two very generous closets we built, which also hid views of the gas and water lines coming into the house. We ended the closet wall three feet short of the basement window, and kept the electric panel in the main room so that it would remain accessible and not be covered by items inside the closets. This view from the end of the stairs shows the long basement closet on the left, and a new Bilco basement access with a Silverline window. By adding the access well, we got more natural light in the basement, which made it possible to comply with the building code formula determining allowable floor space. The escape window also makes it legal to partition off this area into a future bedroom. The owner has been thrilled with this window, which makes the basement room feel like it’s at ground level. The photo to the right is a view when entering the house from the front door. You can see that the floors and existing yellow pine and gumwood woodwork have been refinished. 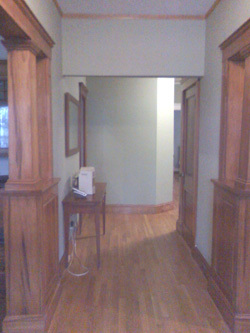 We moved the bathroom door which formerly opened directly into the front hall toward the front door behind us. Note that the 45 degree angle on the bathroom wall creates an open view, which had formerly been restricted by a 90 degree corner and the now completely eliminated rear hall. Emergency Egress window: Required when basement shall be a livable space. No bedrooms shall be built in basements without emergency egress and sufficient light and ventilation. Sill height of window above floor: Not to exceed 44″. Minimum opening area: = 5.7 sq. ft. Minimum opening height = 24″. Minimum opening width: = 24″. Double hung windows used for emergency escape shall be permitted to have a net clear opening of 3.3 square ft. Ceiling height: minimum 7′ 0″ finished. Basement insulation: How this is done is crucial in order to prevent mold and possible water damage. Your basement walls must be poured concrete, not brick, stone or block, and there should be no history of water infiltration. The minimum insulation requirement is only R-9 for basement walls. Before any framing was done, we attached 2″ tongue and groove rigid foam insulation board to the interior basement walls with construction adhesive and concrete screws. This Building Science page shows how. The bottom plate of all basement walls must be pressure-treated wood. After finishing our framing, we further insulated the walls with unfaced R-15 fiberglass batts, creating a total of R-24. Adding plastic sheathing over the studs would have created a vapor envelope, so no further vapor barrier was needed before installing the Georgia Pacific Densarmor Plus fiberglass faced drywall, which is much more mildew resistant than other products. 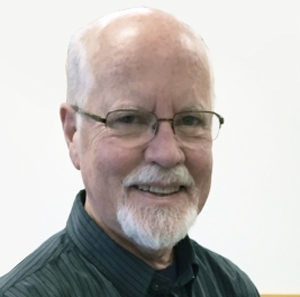 See Bob Villa’s video. Means of Egress: Each sleeping room within habitable basements, or in basements that are designed to house future sleeping rooms must have one exterior door OR one egress window exiting from the proposed sleeping room directly to the outdoors. In this case, we did already have a Bilco basement door as well as a standard exterior door at the bottom of the Bilco stairway. We added the Bilco basement window to the basement room for light and ventilation and so that in the future the sleeping area could be partitioned from the rest of the room. Bulkhead egress: A bulkhead door that has a vertical travel to ground level at or less than eight feet is acceptable as a means of egress according to the MA and national building codes. Check with local fire chief or inspector regarding bulkheads. 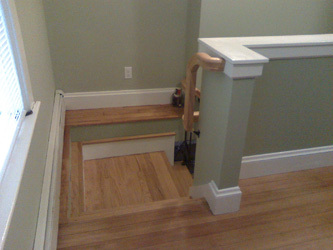 The minimum headroom in all parts of the stairway shall not be less than six feet six inches (1981 mm) measured vertically from the sloped plane adjoining the tread nosing or from the floor surface of the landing or platform. The 36-inch exit door shall be side-hinged. Windows and Ventilation: Each habitable room must have the equivalent of 8% of its floor area in exterior glazing, with half of glass areas to be operable. Construction of basement egress window Bilco Scapewell basement windows. Exception: The glazed areas shall not be required where artificial light and a mechanical ventilation system are provided. The minimum ventilation rates shall be 50 cfm (23.6 L/s) for intermittent ventilation or 20 cfm (9.4 L/s) for continuous ventilation. Ceilings: Minimum 7′ ceiling height. In existing structures where a 7-foot ceiling height cannot be obtained, it is considered non-habitable space. Beams and girders shall not project more than 6 inches below the the 7′ ceiling height in the livable area. Smoke Detectors: Hard wired smoke detectors. Update: In March 2010 the town of Waltham MA received a record rainfall, and for the first time in the known history for this home the basement was flooded. The bottom of the drywall on the interior walls was damaged, but the Georgia Pacific Densarmor panels used on the basement’s perimeter walls was not affected by the moisture! I cut out the bottom 6″ of all drywall and allowed the wall cavities to dry out. I then installed 1″ x 8″ baseboards over these openings so that in the case of future flood events the baseboards could be simply unscrewed from the walls to allow drying. The town did receive another record rainfall later that year, but the basement remained dry.